Nigeria midfielder Christian Obodo has joined Belarusian side Dinamo Minsk, in a move to save his football career. Obodo, who spent more than a decade in Italian football, signed a one-and-a-half-year deal after he was released by Serie A club Udinese last September. "I had offers from other countries, even in Italy but I chose to come to Belarus for a fresh start," Obodo told BBC Sport. "This is the perfect move for me at this point and I hope to make the best of this chance in front of me. "I still have some years ahead. I just want to use this opportunity to put my career back on track. "The management of Dinamo are prepared to give me all the support required to succeed, the rest is up to me." 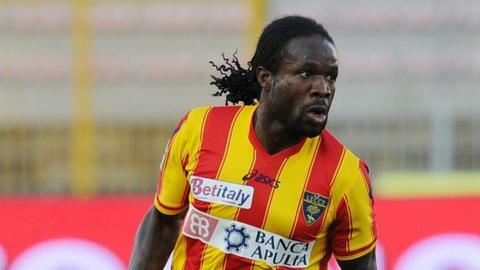 Obodo, 28, joined Italian side Perugia from local side Plateau United in 2001. He went on to play for Fiorentina, Udinese, Torino and Lecce. Although his career blossomed at Udinese, his spell at the club was equally blighted by injury. An anterior cruciate ligament injury kept him on the sidelines for almost two seasons before he was eventually loaned out to Lecce in 2011. On his return, he failed to break into the Udinese first team and both club and player then agreed to cancel the contract by mutual consent in September 2012. He played for Nigeria at the 2006 Africa Cup of Nations and scored in their 2-0 win over Zimbabwe in the first round. Obodo's last appearance for the Super Eagles was in 2008 against Sierra Leone in a 2010 World Cup qualifier. He scored in their 4-1 win.